The lives of a significant number of primary school-aged children and younger are thought to be affected by having a parent with Parkinson’s – and as a relatively newly recognised phenomenon there is little or nothing to support them or to inform the professionals who interact with them. Parkinson’s disease is by no means a condition exclusive to the elderly, but as parents have children later in life so the risk of developing the disease while their children are still quite young increases. As a consequence, little has been put in place to support young children who are struggling with the ramifications of a poorly parent and the complex issues and problems this disease imposes on a family. Families under stress, because of the condition, have little support from teachers, care workers and other professionals who have not been appropriately briefed to understand their needs. A group of people with Parkinson’s in the South West who are members of the Peninsula Parkinson’s Excellence Network (PenPEN) have worked with Parkinson’s UK and Parkinson’s experts and researchers at Plymouth University to produce the first information resource for teachers and professionals who interact with young children. As well as providing expertise, Parkinson’s UK has also funded the resource, with additional support provided by the National Institute for Health Research Collaboration for Leadership in Applied Health Research and Care South West Peninsula (NIHR PenCLAHRC). Called “Listen to my Thoughts”, the resource consists of a film and accompanying text with links for useful information. The film follows the experiences of Jess, a primary school pupil whose mum has Parkinson’s. It shows some of what she has to deal with at home and at school, and ultimately indicates the mutual benefits when she, her parents and her teacher communicate and understand the enormous impact Parkinson’s has on life at home. The film includes quotes from Mael and Amy about their experiences, and an interview with Helen Young, a teacher at Lewannick Community Primary School in Cornwall. 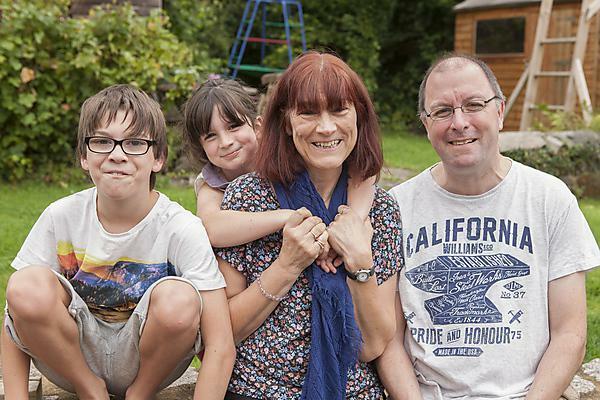 Helen speaks of her experience of teaching children who are affected by living with a parent with Parkinson’s and explains how teachers and other professionals can help. Parkinson's is a degenerative neurological condition, for which there currently is no cure. The main symptoms of the condition are tremor, slowness of movement and rigidity. It is estimated that one person in every 500 has Parkinson’s, about 127,000 people in the UK. Most people who get Parkinson's are aged 50 or over but younger people can get it too. It can be hard on children whose parents have Parkinson’s and Parkinson’s UK has a range of books to help explain the condition. It is always important to explain Parkinson’s and the circumstances with teachers, care workers and other professionals so that they can understand the needs of the child. Lyn Fearn, lives in Cornwall with her husband Eifion (Eif) and children Mael, 12, and Amy, seven. Lyn was diagnosed with Parkinson’s four years ago. "Parkinson’s caught up with me gradually. It started with losing my sense of smell, and then as a teacher I was finding it hard to write on the blackboard. I started to walk with a limp, and was having problems managing simple things like putting my feet into wellies or keys in locks and doing buttons for the children. Like most people, and some of the health professionals I saw, Parkinson’s was the last thing in my mind as a reason for all this. Surely I was too young to have the condition? It took three years to get a diagnosis, and when it came it was a bombshell - we had even been told before by a neurologist it was not a serious problem, certainly nothing such as Parkinson’s. We were having building work done to the house at the time. Eif and I had gone to see the consultant fully expecting to be told we had nothing to worry about. I came into the house and among the chaos, wheelbarrows of cement and workmen I simply burst into tears and fell apart. I remember it was the October half term and we sat in our lounge which has glass doors. I know the workmen could see me in floods of tears, and the children could too. They didn’t understand what was going on and I remember being really scared – simply full of fear. Eif looked like he had been punched in the stomach and I felt confused, guilty and fearful. We couldn’t think of what to say to the children. All they could see was us falling apart and we didn’t have the words. In fact, at the beginning we tried to hide it from them. We got in touch with Parkinson’s UK who were brilliant and gave us some really use information and contacts. We were advised to tell the children, which we did. Everyone makes plans and you think you’ll live forever and your future is bright, but it was like everything we were looking forward to, had gone. I was a relatively young woman with children, which is unusual for Parkinson’s. Life had to go on. The children had to go to school and Eif had to go to work. The children had a hard time at school, not through anyone’s fault but because the teachers had received no training or briefing on what to do in a situation like ours. We told the school, but with staff changes the message just didn’t get passed on. Mael especially was struggling. He felt that he was responsible for me. He would go to school and worry all day and not learn anything. He got into trouble at school because no one understood what he was going through. There was no official support for him or for Amy. As a teacher I realised that, at age four and eight, they simply didn’t have the language or the experience to explain how they felt or to process their feelings. Ours was a crisis for the children more than anyone – at that age they had no one in authority to turn to with the skills and expertise they needed. It was then I really got that children of their age needed to be helped and that we needed to really think about the resources that would be required. There is little out there to explain Parkinson’s to young children, and what there is focuses on older relatives with the condition. This created its own worries and concerns – why is this just about grannies? Are you getting older faster mum? Are you going to die soon? For children of Mael and Amy’s age with a parent with Parkinson’s the concepts and resources are so muddled. It was then that I got involved with the Peninsula Parkinson’s Excellence Network (PenPEN). At the first meeting I went to everything was about older patients and medical advice and I really wondered, what am I doing here? How relevant is this going to be for me? I raised this with the group and we got on to discussing my family’s situation – and it became apparent that we were not alone. We decided that there was a need to develop resources not just for young children, but also for the professionals who interact with them. We wanted children to be heard, listened to and looked after. So, we developed the “Listen to my Thoughts” film and leaflet (the name is actually something Mael said), with backing from Parkinson’s UK and invaluable input from PenPEN and Plymouth University and they are finally complete. We’re really pleased with the results and we are hopeful that they will make a difference. We’re really grateful to Parkinson’s UK and Plymouth University for their support. From now on there should be no reason for young children and their families to feel isolated or hopeless because a parent has Parkinson’s. When you are suffering from a condition which leaves you depressed, exhausted, emotionally drained and frustrated and physically ill so that you can’t be the parent you were or want to be to your children, having no support from the professionals involved with you and your family because they simply do not understand your situation and have not had it explained to them, is soul-destroying and damaging, isolating – not just for you but for your children and family relationships. As more young children are faced with this situation, it is not a problem that is going to go away. In some small way I hope that our film is the first step to ensuring that this is a problem of the past, and that there is a brighter future ahead for families touched by Parkinson’s."